Not about today so a quick post of a photo of some strange squirrel behaviour. 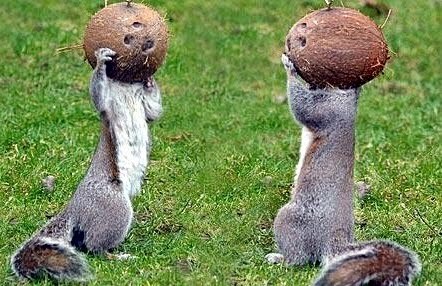 I didn't realise coconuts were a normal squirrel food but, there again, they are known for their love of nuts. Girl Squirrel: "I'm nuts about you." Boy Squirrel: "You're nuts so bad yourself." Thanks JC for sending me the photo. Cute squirrels; milking cuteness for all it's worth! !